This post is sponsored by Violet Iodine, but all opinions expressed are always entirely my own! Back in July, I had a conversation with my Dr. about taking the daily iodine supplement Violet Iodine. All of my adult life I have suffered from excessive breast pain along with all of those other wonderful PMS symptoms. Read more about VIOLET IODINE and it’s uses at VioletDaily.com. While Midol would help with the bloating and cramping it did nothing for the tenderness, swelling, and heaviness of my breasts that I experienced every month. I wrote my first post about Violet Iodine right HERE! So I started taking Violet Iodine thirty days ago right along with the other supplements that I already take every morning. I didn’t notice any kind of side effects at all…except for one. IT WORKED! Even though I am perimenopausal and don’t have a period every month. I still get the symptoms of PMS every month whether I have a period or not. My stomach still cramps. I still get the bloating that makes me feel as if I am going to explode and I still have the tender, swollen breasts every single month. This past month I am happy to say that I had none of the tenderness. Absolutely no heaviness, and no swelling. As a matter of fact, my breasts didn’t hurt at all for the first time since before I started having my periods. I only wish I had found this product sooner. I think of all the years I suffered and here there was something so simple that took all of pain away! It’s very easy to do. Take one pill in the morning on an empty stomach. If one supplement doesn’t give you the relief that you are looking for the directions say that you can take one more in the evening. I only had to take the one in the morning for it to work for me! You can buy Violet Iodine right over the counter! No prescription needed. If you know anyone who is like me and needs some relief from monthly breast pain due to PMS tell them about Violet Iodine, they will thank you for it later! Thank you Violet Iodine and Blogger Babes for this wonderful opportunity. Let me know what you think by tagging #HugsShouldntHurt on Facebook and Twitter. « I’VE BEEN ROBBED BY ALZHEIMER’S DISEASE! Wow, I had never heard of this before! So glad it helped with your symptoms. I remember when I used to have periods and my breasts always hurt so much! Wish I had known about Violet Iodine back then to relieve the pain! I know! When I think of all the years we suffered without anything like this to help us! Thanks Marcia! I had no idea! Thanks for sharing this & glad you got relief. Great! I’m glad there is something that works. Thanks for following up and sharing, Rena! I had never heard of this product before, but it is good you are getting relief! I will have to check it out more very soon! Oh, the miracles of modern medicine! Will pass this along to my daughters and granddaughters! Never heard of it but glad it helped you. I don’t have any of those problems anymore thank goodness. Christie recently posted…Toy Story Land, Star Wars Land & Avatar Land at Disney World – Oh My! I love the campaign, hugs shouldnt hurt! Look sometimes during that time my breast do swell up and hurt a bit glad there is a product on the market to relieve it! I hope it helps you Kiwi! Thanks for commenting. I’ve never heard of this before. It’s great that it’s working for you though! I try to stay away from many supplements and stick to my routine vitamins! I don’t take very many things like this either, but it has been a great healthy remedy. Great Miranda let me know how it works for you! Some day I will tell you about my PMS. No I won’t except for the color coded chart my friends made for me: red–don’t go near her; all the way down to white—she’s wonderful, see her! You always make me smile Pia! I will definitely pass this on to my daughter who has been suffering with these symptoms for years. Great Doreen! I hope it helps! It amazed me how all these medicines works. I do have all those symptoms every month except the cramps. I might consider this pills help me. It very well may Mhie. It’s available over the counter. I hope it brings you relief. Wow, this is the first time I’m hearing about iodine as a supplement. I’ve always heard it as something to stay away from. Sounds interesting, glad it has helped you. Iodine is used in lots of things most commonly in table salt. Large quantities are dangerous. Wow, I have never heard of this and it sounds like a really helpful product. I will keep this in mind for when I need it. You can get it right over the counter and it works great! I wish I had known about this years ago. I don’t seem to get as much breast pain as I used to. I’m looking forward to the day when those stupid periods are gone for good! Me too Lana! I only have a couple a year now so I figure they are on their way out! This looks interesting! My daughter gets lots of bloating and cramps, and this might help her. Stephanie of The TipToe Fairy recently posted…The EASIEST Way to send in Box Tops! It won’t help those symptoms Stephanie. 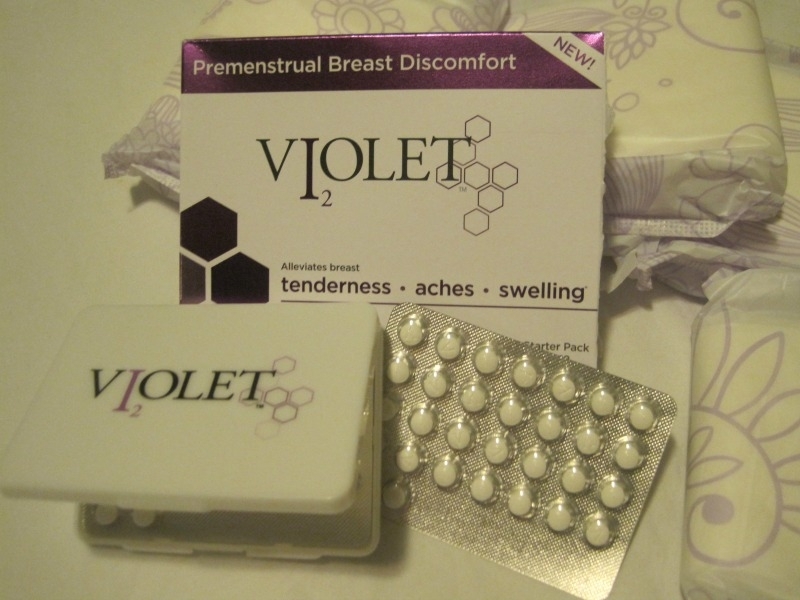 Violet Iodine is for the swelling, pain and heaviness of breasts during PMS. I never heard of this before but now that I have I will tell anyone who has those symptoms to try it. I’m glad you found the right supplement for you! I can imagine the pain I’m just glad it all worked out well. When I was in my teens, getting my menstruation was the worst ever. I used to literally lay on the floor and cry. I even had blackouts in school. Shaney Vijendranath recently posted…Centrum Guardians – Have you voted yet? I’ve never had black outs, but the symptoms were pretty bad. This is a new product that I have never heard of before and will have to check it out. These are weird times for my body so I will discuss with my doctor on testing this out. I know the feeling. As we get older our bodies get a mind of their own. I haven’t heard of it until now. I’m glad it only took one to work for you! I hope you find it valuable Rosey! I’ve never heard of this, but it sounds like a great product! Glad it’s been helpful! Hope it helps you if you have similar problems. I didn’t even know this product was available. Glad it worked so well for you! I have never heard of Violet iodine but it sounds like something I should look into. Great post!! You should Ricci! Thanks for stopping by. Wow! This is an amazing product! I had not heard of it before. Luckily, my birth control controls my PMS symptoms pretty well but I will remember this product and pass the info on to my sister. Thanks for sharing! Wow – that’s fantastic! And even more so…I didn’t have to wait a month for the recap! Haha! THanks Liv you always make me laugh! I’ve never heard of this supplement! I’m so glad it’s belong with your symptoms. PMS can be a beast! You are so right Angie! I sure can be! Glad to hear this has worked for you Rena! I’m sure you have already thought of this, but just be sure to let your doctor know you are taking it. Over-the-counter medications can sometimes interact with other meds that we are taking, and adjustments may need to be made. Thanks Susan! I always appreciate you support!